“It is easy to invent a flying machine,” said the 19th century aviation engineer Otto Lilienthal, “[and] more difficult to build one; to make it fly is everything.” The challenge of air (and later, space) travel began not with building aircraft, but with building a realistic simulation machine in which to test those aircraft. The same went for NASA, in its earliest incarnations. When I visited a few years ago, the massive warehouses and test sites had mostly been turned into museums. But at one time, those superstructures held the key to putting man into orbit. Massive, yawning wind tunnels, huge scaffolding towers, and million-ton excavation sites were the first concrete (har har) evidence of progress towards space. Sure, the rockets and shuttles stole the show—but there’s a whole bevy of remarkable construction achievements that went along with building them. 1927: At Langley, this Propeller Research Tunnel was the testing site for the first full-scale airplane, the Sperry M-1 Messenger. What we're seeing here is the "exit cone," where Elton W. Miller, chief of aerodynamics, is standing. 1931-34: Hangar One, at the Naval Air Station in Sunnyvale, was one of the largest buildings of its kind. It was built to house the Navy dirigible (! ), USS Macon. The hangar could house up to ten football fields, and has unique doors that "roll back" like an orange peel. After the Macon crashed, it became a training facility. Another construction shot of the massive Hangar One. 1942: This dramatic view is looking into the cooling tower of the 16ft High Speed Wind Tunnel. 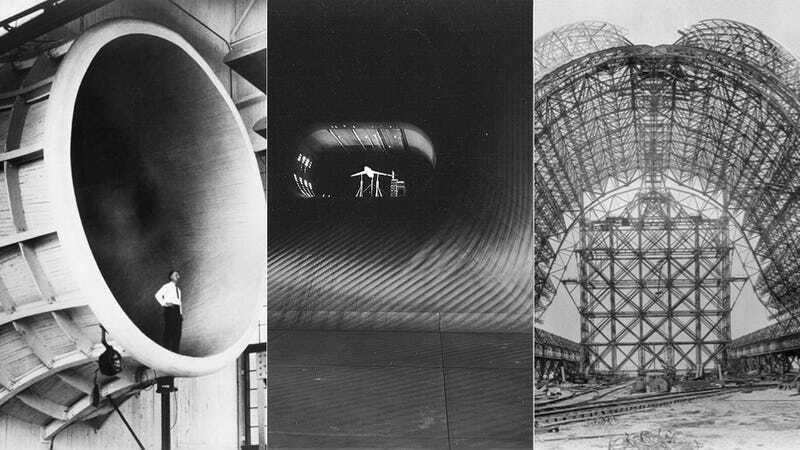 1943: A view of the entrance cone to Ames' 40x80ft Wind tunnel, with a blimp in the background. 1947: Here, we're looking "down the throat" of the world's largest tunnel, the 40 x 80 foot wind tunnel at Ames. At top speed, six 40-foot-wide fans would drive air at 40 miles per hour. That model at the top looks small—but actually, it's almost 50 feet long. It's mounted on stilts because it's undergoing drag tests; NACA readily supplied that data to American aircraft engineers. 1948: After World War II, National Advisory Committee for Aeronautics, or NACA, pushed the wartime engineering boom forward at the Ames Aeronautical Lab, in Moffet Field, California. For example, this 16-foot High Speed Wind Tunnel, where new ideas about aerospace engineering were hatched in the late 1940s. 1950: This photo shows the acoustic housing of the original Supersonic Wind Tunnel. The housing was added because of complaints from neighbors about the noise—so NASA engineers had to build on a noise-dampening section. 1950: Remember the sharp corners of the wind tunnel above? It was a challenge to get the air to flow smoothly through the corners, so engineers designed these weather-vane-like slats (seen here at the Pressure Wind Tunnel at Langley), which forced the air to turn corners more smoothly. Without the vanes, turbulent eddies would've skewed the test data. 1956: A 24 foot diameter swinging valve at various stages of opening and closing in the 10ft x 10ft Supersonic Wind Tunnel. 1957: Engineers inside of the 10x10 Supersonic Wind Tunnel check on a model of a supersonic aircraft. 1957: "The Gimbal Rig," explains NASA, "was engineered to simulate the tumbling and rolling motions of a space capsule and train the Mercury astronauts to control roll, pitch and yaw by activating nitrogen jets, used as brakes and bring the vehicle back into control. This facility was built at the Lewis Research Center, now John H. Glenn Research Center at Lewis Field." 1962: A model of the Lockheed C-141 model hangs in the Transonic Dynamics Tunnel, he world's first aeroelastic testing tunnel—which required a tunnel that could simulate gusts. NASA explains that "by the late 1940s, with the advent of relatively thin, flexible aircraft wings, the need was recognized for testing dynamically and elastically scaled models of aircraft. In 1954, NACA began converting the Langley 19-foot Pressure Tunnel for dynamic testing of aircraft structures. The old circular test section was reduced to 16 x 16 feet, and slotted walls were added for transonic operation. A model support system was devised that freed the model to pitch and plunge as the wings started oscillating in response to the fluctuating airstream." 1964: This huge crater-like excavation site was dug to create a foundation for the A-2 test stand, which was built to test and flight-certify the booster system for the Apollo mission. 1960-64: Here's a test stand under construction—actually, it's a test stand being completely remodeled, since the early stands weren't large enough to accomodate the huge stages of Saturn V. It had to hold down the 7,500,000-pound thrust produced by 5 F-1 engines, so the stand used hundreds of tons of steel and 12,000,000 pounds of cement—the foundation alone reached 40 feet below the earth.